The word Savishkar means having manifestation or making an exhibition of any power or talent. Savishkar is a management exhibition organised to develop the skills of the 1st year BBA students. The exhibition was a one day event held on 20-February 2019. 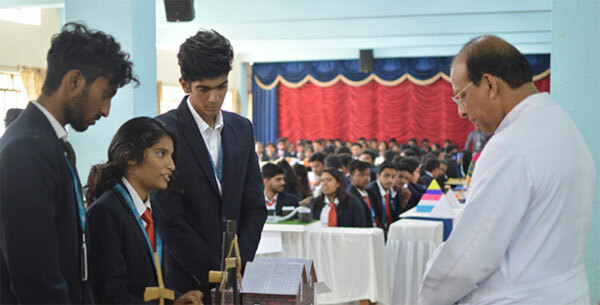 The students were divided into teams of 8 each and totally 42 teams participated in the exhibition. The class animators assigned various management topics to different teams. The exhibition was inaugurated by the principal Rev. Fr. Josekutty P.D and two chief guests, Dr Per Markus Anderson, Associate Dean for Global Learning Concordia College, Minnesota, USA and Prof. Christopher J. Mason, Interim Director, Offutt School of Business. The Principal emphasised on the knowledge and its importance the students are groomed with. This exhibition integrated the skills of students in management and art to exhibit their innovations with a sense of competitiveness. Different teams were assigned with various topics. Some of the topics are Airport system, QR scan ATM, L&T Defence, Aeroplane manufacturing, etc. The exhibition witnessed great teamwork and knowledge of the students in the form of exhibits. The exhibits were judged by two Faculties . Rev. Fr. Emmanuel P.J and Mr. Surendranath Reddy, Head of Department of Management felicitated the winners during the Valedictory ceremony. The teams were judged on their performance with respect to the different criteria such as presentation, fluency, knowledge and spontaneity to the various questions posted to them and cash prizes were awarded to the winner along with 5 consolation prizes. On the whole, SAVISHKAR served as an important element of positive learning in the field of management and hence the event ended in a lively mood as the students celebrated with great energy and pleasure, which would be a great boost in their hearts in the years to come. Department of BBA organized a discussion forum on the Union Budget 2019 for the students on 6th February 2019 in Main Auditorium . The students were divided into six teams and each team had two students who were assigned to present their respective topics such as Indian railways, Defence system of India, Women-led India, Impact on Agricultural sector, Gratuity, GST, Income tax and Unorganized sectors. All the participants were very good with their presentations and discussion forum. 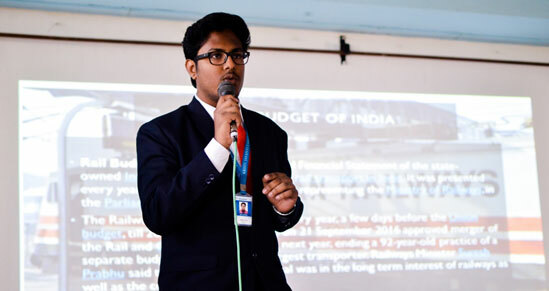 From this session, the students got to learn various aspects of the Union Budget and they highlighted on the key points which were discussed in the Budget Union 2019. (1) 12 crore farmers with under 5 acres of land can get annual income support of Rs 6000 directly into their bank accounts. (2) 3 crore salaried, pensioners to gain between Rs 500 and Rs 3600 a year in the tax savings due to higher standard deduction. (3) 10 crore unorganized sector workers eligible to get pension up to Rs 3000 a month after age 60 on a contribution of up to Rs 100 while working. (4) The main gainers from the Budget are Tax payers, Investors and Businessmen. The students imbibed a lot of vital information from the session. Overall it was an interesting and interactive Session. The department of management inaugurated its Social Responsibility Week 2019 on 7th of January at 3:30 pm in the main auditorium. The theme for the week was United Nations Sustainable development goal-I, Poverty. The chief guests for the day were Mr. Dilip Kumar, president, Fora Recycling, Ms. Samitha Manoharan, Head, CSR, Target Corporation and Mr. Sriram CA, Target Corporation. The inauguration began with Prof. Manjunath's prelude about the week and the theme. This was followed by Rev. Fr. Josekutty P.D, the Principal addressing the gathering. In his address, he stated that social responsibility is the outcome of individual responsibility and a minor change will also result in real change. He also mentioned about the college being the Universal hub for United Nations sustainable development goals(UNSDG). With this, Rev. Fr. Josekutty P.D handed over the session to the chief guest, Mr.Dilip Kumar. Mr. Dilip emphasized on the importance of triple bottom line point in CSR. He mentioned that companies should find out the hazards caused by them and take necessary steps as a part of their CSR. He also appreciated the department for organizing such programs which inculcates the need for social responsibility in students. Mr. Dilip Kumar's address was followed by Ms. Samitha Manoharan, who introduced Target Corporation and its CSR activities to the gathering. She stated that Target is engaged in CSR activities even before it was made mandatory by law. Further, Mr. Sriram took over the session and concluded by encouraging the students to take full advantage of CSR week and the opportunities. The inauguration ended on a high note and served as a great start for the week. In this event, students come up with different social issues and provide practical solutions to it. There were 12 teams consisting of 2 participants each. The participants were from first year and second year. Some of the issues presented by the teams were Poverty, Pollution, Hunger, and Traffic. Social Entrepreneurship is an event in which students present their business models based on some social issue. These models are solutions to various social issues. There were 14 teams consisting of 2 participants each. The participants were from first year and second year. Some of the issues covered by the business models were Road accidents, Hunger, waste disposal and Agriculture. Poster making is an event which brings out the artistic side of students. There were 41 participants from the first years and second years. The participants were given the topic "Eradication Of Poverty" on the spot. The participants were required to come up with a handmade poster within 1 hour. This event really turned out to be a visual treat. A tableau is a piece of art such as a sculpture or painting that shows a scene. The students were required to show a scene that represents a social issue for 1 minute. There were 8 teams consisting of 8 students each. Some of the issues presented by them were Dowry, Women Harassment and Hunger. "Every short film story is a golden opportunity to showcase creativity"
In this event, students were required to make short films not more than minutes on a social issue. There were 10 teams consisting of 2 students each. Some of the issues presented were Hunger, Cyberbullying, Depression, and poverty. Social Responsibility week 2019 ended on a high note. The valedictory session began with the feedbacks of participants from the first year and second year. There were 628 students who participated in the SR Week.They gained awareness about various social issues and different ways to solve the issues. They got inspired and motivated to be more socially responsible individuals. The feedback session was followed by Rev.Fr. Lijo P Thomas's address to the students. He appreciated the efforts of the department for organizing such an event. He emphasized on the practice of giving back to the society. He also mentioned how people have increased being active on social media rather than being socially active. He concluded by encouraging the students to be more aware and responsible about the society. There were 2 winners for each of the events conducted. The winners were felicitated with Certificates by Rev. Fr. Lijo P Thomas. The Social Responsibility week 2019 served as an important period for the enrichment of students' participation in the society. Hence the event ended on a lively mood as the students celebrated with great energy and motivation to be more socially responsible, which would be a great boost in their hearts in the years to come.